A one night, one time only concert at Radio City Music Hall in New York City in which some of the greatest performers in the history of Blues music, including BB King, Bonnie Raitt, Steven Tyler and Macy Gray performed together. 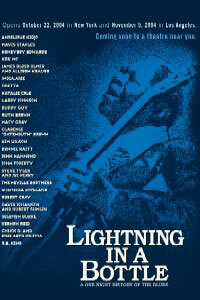 Captures the emotional spontaneity that only live performances of the Blues can. Interviews with BB King, Bonnie Raitt, Buddy Guy, Chris Thomas King, Dr. John, Jimmie Vaughn, Honeyboy Edwards, Ruth Brown, Shemekia Copeland, Solomon Burke, Steve Jordan, and Vernon Reid.